UniClean offers three basic cleanroom garment service programs (see Program Options), that can be tailored to customer specific needs. UniClean provides specialized services uniquely designed to accommodate industries with Bio-Safety Level (BSL) requirements. UniClean offers cleanroom cleaning and maintenance programs to help customers operate their facilities within specified classification goals. UniClean stocks a wide variety of cleanroom disposable items, including: gloves, shoe covers, face masks, and tacky mats — all deliverable on predetermined schedules. 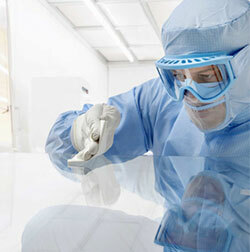 UniClean also supplies quality cleanroom furnishings.